Fondly known as ‘Pav’, he played over 300 games in the green white and black of the ‘House’ and has served numerous roles on the committee; including his current term as President for a record ten years. Pav accepted the award on behalf of the people who work tirelessly to keep grass roots football teams and associations alive and well. “I’m honoured, but I’d like to accept this award on behalf of volunteers of AFL Victoria clubs and clubs across the country,” he said. He acknowledged that volunteers do not do what they do for recognition, but to be involved in their local community. “We don’t do it for the glory. We do it because we love helping and being a part of something that matters,” he said. 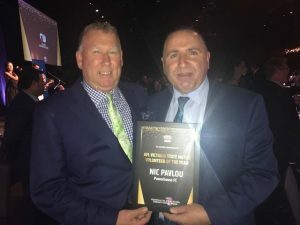 Pav ended by highlighting that he finds the most joy in seeing the helping people around the club, who are united by the love of Australia’s great game.